Before the 2015 season started, third-year New York Liberty head coach Bill Laimbeer, ever the basketball pragmatist, knew what many experts had predicted for his squad in 2015 after coming off two consecutive non-playoff seasons. “Stewieland,” said Laimbeer in the postgame press conference, referring to University of Connecticut senior and National Player of the Year Breanna Stewart, who many believe will be the overall No. 1 pick in next year’s WNBA Draft. 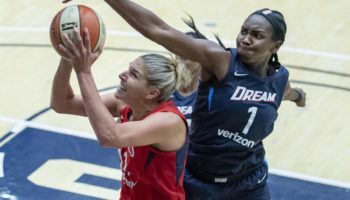 But winning the WNBA lottery was put on hold this season; the Liberty are currently too busy trying to win their first WNBA championship. 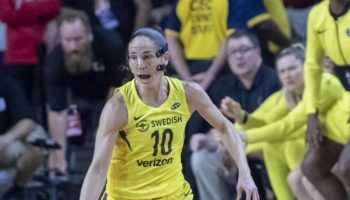 New York, led by All-Star center Tina Charles as well as their superlative bench, advanced to the Eastern Conference Finals with a captivating 79-74 victory over the Washington Mystics in the deciding Game 3 of their first-round series at Madison Square Garden. 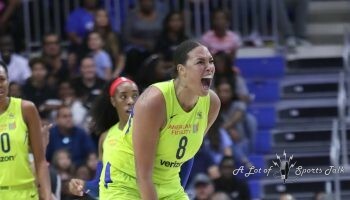 Charles had 22 points despite constantly being pushed around by the stable Washington bigs all night, but she and the other starters got a big boost from the bench, who scored 40 of the team’s 79 points. Sugar Rodgers had 20 points, eight of those coming on an 18-2 run spanning the first and second quarters to erase a 12-point first quarter deficit. Candice Wiggins added 12 points on four three-pointers while a current first-round pick from Connecticut, Kiah Stokes, had eight points and 13 rebounds in extended time playing for an injured Carolyn Swords. It was Stokes’ block of an Ivory Latta three-point attempt with under 10 seconds to go that preserved the game as the Liberty were holding onto a 77-74 lead. On the possession before, Epiphanny Prince, who struggled with her shot all game long, hit a tough fadeaway jumper with 20.2 seconds remaining to give New York that three-point cushion. Prince went 2-for-12 from the field for seven points. The series will go down as one of the classic WNBA playoff series, especially given the two games at Madison Square Garden. 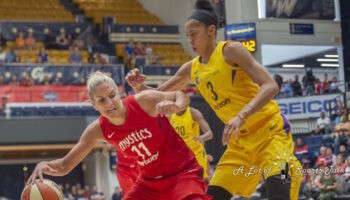 In Game 1, Latta hit a game-tying three pointer under 30 seconds to go in regulation, helping the Mystics steal home-court advantage in an 85-80 double-overtime victory. After a dominating performance by the league’s best road team in Game 2, the Liberty came back to MSG and the raucous crowd which, although being shy of a sold-out crowd, was just as boisterous as Game 1’s sellout. Game 1 of the Eastern Conference Finals between the Liberty and Indiana Fever – who defeated the Chicago Sky in the other Eastern Conference semifinal – is tomorrow, as Pope Francis’ visit to the United States will take him to the World’s Most Famous Arena on Thursday, where he is scheduled to deliver mass. 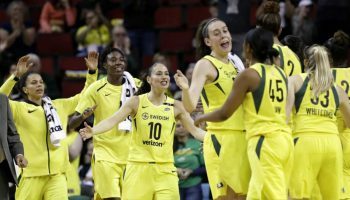 The winner of that series will head to the WNBA Finals to take on the winner of the series between the Phoenix Mercury and Minnesota Lynx in a rematch of last year’s Western Conference Finals.